The Sundarbans delta is the largest mangrove forest in the world. It lies at the mouth of the Ganges and is spread across areas of Bangladesh and West Bengal, India, forming the seaward fringe of the delta. Interestingly, the Bangladeshi and Indian portions of the jungle are listed in the UNESCO world heritage list separately as the Sundarbans and Sundarbans National Park respectively, though they are simply parts of the same forest. 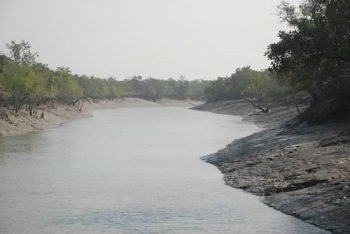 The Sundarbans is intersected by a complex network of tidal waterways, mudflats and small islands of salt-tolerant mangrove forests, and presents an excellent example of ongoing ecological processes. The area is known for its wide range of fauna. The most famous among these are the maneating Royal Bengal Tigers, but numerous species of birds, spotted deer, crocodiles and snakes also inhabit it. It is estimated that there are now 500 Bengal tigers and about 30,000 spotted deer in the area. We had previously visited the Bangladesh Sundarbans back in 2006 and had enjoyed the experience so we decided to give the Indian WHS a try when we flew in/out of Kolkata on a trip to the NE of India. The drive south from Kolkata takes around 2.5 hours and this gets you to one of a number of jetty points from where to travel onwards – ours was at Gothkhali. From there boats are available into the Sundarbans (though you can get further by public transport across several islands by short ferries and auto/cycle rickshaws). By boat the official entrance is a further 2 + hours further on mostly through heavily populated areas on either side of a mainly narrow waterways. We had arranged an overnight at the Sundarban Tiger Camp situated just outside the park (reasonable standard) but first went to the Park HQ at Sajnekhali for registration/payment of fees etc. The only accommodation inside the park is here but our lodge was only across the river at Dayapur. Sajnekhali was a disappointment. Its caged area contains a reasonable interpretation centre and a concrete watch tower but the distinct lack of any significant wildlife most of the time from that tower had been “compensated” for by the distant positioning of laughable, life size, plastic animals such as tiger! The Sundarban tours which operate from there are conducted in traditional-hulled motor boats with a cabin and a deck verandah, capable, I guess, of taking some 10 tourists (though most, like ours) operated for just 2 PAX. The tour consisted of various routes through the mangrove-lined rivers. During these transits the occasional deer, monkey and crocodile were readily visible as was a reasonable range of birds. The main destinations for such tours were other watch towers – in our case at Dobanki and Sudhanyakhali. These were set out with “site lines” cleared of undergrowth and stretching several hundred metres in several directions across which no doubt animals do occasionally pass. Similarly there were man-made scrapes which no doubt attracted animals looking for a drink. However, the fact that the hours during which the mangroves can be visited means that one can’t actually reach these towers at day break or stay until dusk significantly reduces one’s chances of seeing much. We were particularly amazed by the relatively recent construction of a half km concrete “Canopy Walkway” at Dobanki. This seemed to go nowhere of any likely interest at all! We were told that it crossed a fenced area in which a captive group of deer had been kept but that these had been release to provide “tiger food”. This fence is a significant double construction but sits beyond the walkway which only passes over the “deer park” What a waste of money. Our visit was in any case totally ruined by a group of workers with hammers and pick axes who were repairing the fences around the area and scared off anything which moved! During our visit high tide was occurring at around noon – this was unfortunate as the best time to see wild life and beyond the green mangrove foliage, is at low tide when the mangrove roots and sandy banks are exposed. If you have a choice and can find out tide times try to synchronize your visit with as much “low tide” as you can. At Sajnekhali the way of life of peoples living around the Sundarbans is explained and this is, to some extent, on view in the form of fishermen and shrines to Bonbibi the guardian spirit of the forest who is believe by the locals to protect honey gathers and wood cutters from the demon king Dakkhin Rai who appears in the form of a tiger. However the Tiger reserve is not supposed to be open to mixed use except to limited numbers at e.g honey gathering time. I. Mangrove Interpretation Ccnters at Sajnekali & Bliagabatpur. 2. Five Watch towers with cage path. The Mangrove Interpretation Centre at Sajnekhali includes signs describing the Sundarbans as a WHS and showing the boundaries of the Biosphere reserve but do not make it clear that Sajnakhali is only in a buffer zone of the National Park. In conclusion, even excepting the fact that one can only enter the WHS buffer zone, the Indian Sundarbans don’t, in our opinion, offer a visiting experience anywhere near as good as that in the Bangladesh Sundarbans (see my review). If you have never seen Mangrove swamps and are in Kolkata it is just about worth going. Similarly if you just love such locations – otherwise I would give it a miss! I went to Sundarban World Heritage site with my son in a cruise named M.V.Paramhansha. It started from Millenium Park on Friday. Some Foreigners are there also. We enjoyed thoroughly our trip. It's 3 days trip. First day we stay near Namkhana. Next day we went to visit different Islands with a small boat. Food was really tasty and healthy. To see the different cricks and crevices you will be thrilled. The silence itself a beauty over there. Jungle birds like Cranes, Water ducks,Parrots,Titir,KingFishers are really interesting. If you see the different tributaries of River Hoogly it's amazing. Sundari plants are main vegetation overthere. 7 different rivers meet at different points. Like Hoogly, Matla, Saptaparni, Caning, Brahamaputra, Padma and Ganges are really worthwhile. If you see the different flora and fauna over there by watch tower at different islands you can locate spotted deers, Cuckoo,mudskippers,moniter lizards, Crocodiles and turtles too. The people stays over there are very poor. Only they can avail fish and honey. Agriculture is there like (Paddy and Sunflower). Some areas are covered with Solar power. Internal arrangement of cruse is really excellent. Sundarbans, locals called Snderbunds. Now Sndarbans and its tigers are making news every day. Tigers are getting in the villages for easy prey. All these make Sundarbans more and more popular every day. But heard from tourist, that they never seen tiger there with repeated visit. 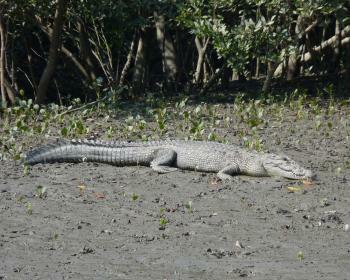 Very recently I went to Sundarbans and found lots of people are traveling there. It is good for locals as they able to get quick money. But I found the crowd makes lots of noises, especially on weekends. Tracking a tiger is hard in the dense bush, but if you give more time to certain watch towers then your chances will be bigger. For this you need to spend more silent hrs there. You can try Trips2world.net for specialized tiger safari packages in Sundarbans. It is important for tourists to know that the chances of seeing the tiger in this place is very very less. The main reason is that the jungle is inacessible by land, and one hs to use a motor boat. Since narrow creeks cannot be traversed using the motor boats, one generally end up cruising in the river, expecting soem animal to come by to cross the river. In this sense, unlike other jungles where animals are actively pursued using pug marks, other clues, in this place, one ends up passively waiting for the animal to some how come to the banks of the river. Also in package tours the time at the watch tower is only about 15 miniuts, the rest of the time is for travelling from the camp o the watch towers by boat. Staff was cooperative and kind. The village and the villagers were simple and loving. But the main purpose of the trip i.e to watch wild life is genearally defeated. We could not even spot a monkey in the three days at the camp.